ORDER YOUR BULLFINCH COMIC BOOK TODAY! Hopefully you’re also hip to the fact that TL does his own comic which he both writes and draws, Bullfinch. That’s right, Mr. Collins is not just a pretty face. He’s been known to write a mean strip of dialogue on a thrice weekly basis. ONLY TWO MORE PAGES LEFT IN THE SOCIETY OF HEROES ORIGIN! I’ll bet this story has been going on so long that some of you out there think that SuperFogeys Origins is ONLY about the SuperFogeys in the fifties. While that would no doubt be a great story to pursue, I have something slightly larger in scope in mind. Once this story is done, TL Collins (who, let’s face, is freakin’ amazing) will be taking a short break and you’ll be treated to the origin of Tangerine, which takes place 5 or 6 years after this story (Artist to be announced–I want to blow your minds at the right time). Then, TL comes back and we’ll be telling Herman’s life story (the shape-shifter who impersonated Dr. Rocket during the first 5 chapters of the Valhalla continuity). These will both be short, five page stories–a format I want to play more with rather than doing these 22 page monsters. DAVID “LEGEND OF BILL” REDDICK DRAWS THE SUPERFOGEYS! And those are just his current projects. David and I are also both members of the webcartoonist collective Tall Tale Features. We got to talking today, and pretty soon I had a two-page commitment from David to do a guest spot on SuperFogeys Origins! How freakin’ sweet is that? Don’t know yet when exactly you’re going to see this little collaboration, but look for it soon! You know with Reddick it’s going to be amazing. Be sure and also check out his baby, The Legend of Bill, one of the very best and most well-developed comics out there. See you on Thursday with SuperFogeys 214! 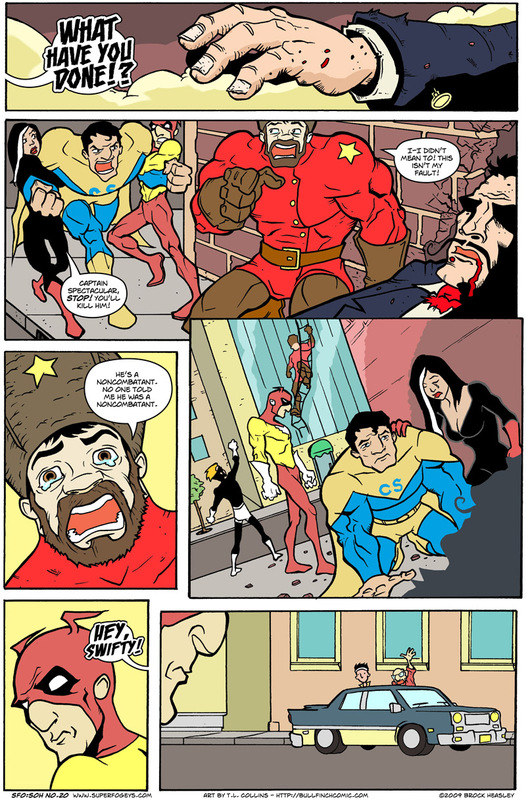 Order your copy of SuperFogey Collection #4, REGULAR Edition here!ORDER YOUR BULLFINCH COMIC BOOK TODAY!